As a member of SNS, you are no doubt aware of our ongoing efforts to reduce state-sponsored theft of crown jewel intellectual property, under the auspices of the global consortium INVNT/IP (Inventing Nations vs. Nation-Sponsored Theft of IP). We want to share with you news of a 60 Minutes television broadcast on this topic, scheduled to air this coming Sunday evening, January 17th, on CBS. (The published schedule lists the showtime as 8pm PT, but please check your local listings.) This program was the direct result of our INVNT/IP work with 60 Minutes reporter Lesley Stahl and her team during and after the Aspen Security Forum last July. We have been working with them since that time to make this happen. We are particularly grateful to John Carlin and Marc Raimondi at the Department of Justice; Stephanie Douglas, Special Agent Kevin Phelan, and key personnel leading the FBI; Dmitri Alperovitch at CrowdStrike; and Evan Anderson, author of the research report “Theft Nation: How IP Theft Drives the Chinese National Business Model, and Its Effect Upon the Global Economy,” which provides the source material for the program. Almost everyone involved has read this report and/or been personally briefed by our team prior to the production. We appreciate your interest in this major issue and your support of our efforts. 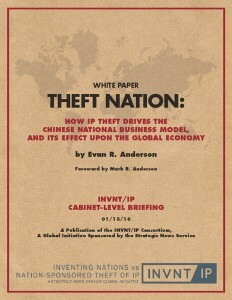 As you know, while most of the work of our INVNT/IP Global Consortium is done in secret, we also recognize the need for public education to garner public support and corporate engagement in solving the problem of institutionalized theft and damage to innovation-based national economies. Please feel free to contact us directly if you have any questions about this work. ‹ China: Innovator or Thief?